As 2017 comes to an end, we feel it’s important to reflect on how far we’ve come in our work to inspire hope and empower independence. As an organization, our year was spent working to support the individuals and families that come to us in a time of need. Together, as a community, you helped us make an impact. 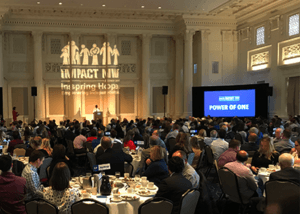 Side by side with our generous business partners, sponsors, clients, donors, volunteers, and funders, we’ve made steps towards a future where everyone in the Portland metro area can thrive. We’re happy to share some of our favorite moments of 2017 as we look forward to another fantastic year. This year, our community rallied to support those in need. At the Power of One Luncheon, we awarded the Yolanda Award to Anthony, a client of our Richmond Place transitional housing building, whose hard work and perseverance allowed him to reunite with his children and secure permanent housing. Hundreds of our supporters came out to celebrate at our Annual Garden Party. SHINE Community School participant Martha and her family shared their heartwarming story of getting involved and giving back to the community they love. 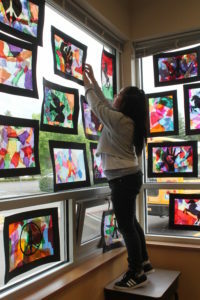 A student at the Beaver Acres Impact NW SHINE Community School hangs up her artwork for display at a student showcase. With the support of the Oregon tech community, our first Impact Kits were built, providing hygiene supplies to 300+ people in transition or living on the streets, and supporting long-term efforts to end homelessness in Portland. Our Holiday Hope Drive ran from November through December, where 1,000 clients received holiday gifts from our generous donors. With the help of our partners, over 700 clients received warm winter coats. We worked hard to support our clients. And our clients worked hard, too. As an organization, we worked to support families regardless of their citizenship statuses. Our SUN and SHINE Community Schools provided “Know Your Rights” resources and classes to families, and fostered communities of acceptance and inclusion. Our Community Resource Desks (a collaboration with Providence Health & Services) served thousands, providing support in navigating the complex safety net system. Located at Providence locations throughout the Portland metro area, we helped connect individuals & families to financial assistance, health insurance, housing & rent assistance, and more. The Portland metro community saw an increase in housing stability of veterans, due in large part to our housing program’s fantastic supportive services to struggling veteran families. This year, Portland was recognized by the White House for its success in curbing veteran homelessness. 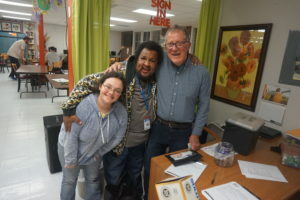 Two participants of Club Impact hang out with founder and volunteer Ralph Gilliam (right) during one of their weekly clubs. Club Impact, a social club for young adults with disabilities, celebrated its 7th birthday. The fully volunteer-run club fosters close-knit bonds between the young adults who attend. To all those who have joined us in the crucial work to support our neighbors in need: Thank you. Together, you have helped us make meaningful differences in the lives of thousands. As the year draws to a close, we’re looking forward to maintaining this momentum to create an even more impactful 2018.